What is “Nikko Saru Gundan”? - Here, we update the latest information from Japan!! The organization that runs this show training a group of monkeys is called “Nikko Saru Gundan”. The founder of this organization used to train two monkeys when they first founded in 1984, but the organization added 13 more monkeys later on and formed a group called “Nikko Saru Gundan” of 15 monkeys in total. It has become so popular with the performance of one trainer and several monkeys, since the monkey-showman was basically performed with one trainer and one monkey. This Nikko Saru Gundan started to boom in 1992 in Japan. Their performances were televised almost every day, and it became so popular that there wasn’t anybody who didn’t know about it. With that popularity, the “Nokko Saru Gundan Gekijo” (theater) became a huge success as well. It was a full house every day and some tourists couldn’t even enter the theater. 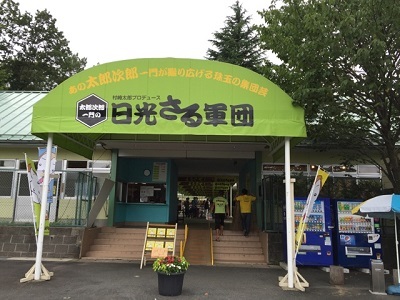 However, the boom is gone and “Nikko Saru Gundan Gekijo” was at last closed in 2013. But guess what! The “Nikko Saru Gunda Gekijo” reopened with a brand new monkey entertainment in April 2015! Check out the formal URL. When you come to Japan, please go visit here! Even if you don’t understand Japanese, you will surely be healed and satisfied with such adorable monkey performances.